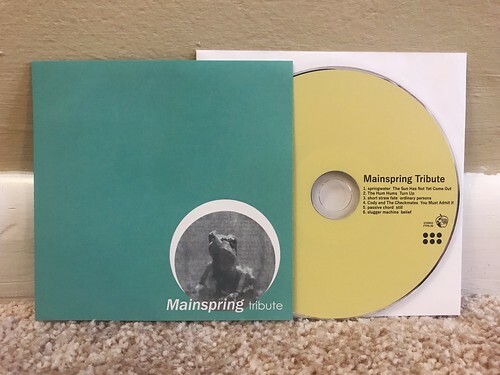 I will have to admit up front that I am not familiar with the band Mainspring. I bought this compilation CD based on the fact that The Hum Hums and Short Straw Fate were both on it. Though after listening to this six song tribute, it's pretty clear to me that I may have missed out on a band that is probably right up my alley. The CD starts off with a band called Springwater. I've also never heard of them, but their contribution "The Sun Has Not Yet Come Out" is a hell of a song and a great way to start off this CD. It's got guitar octaves in just the right places and an incredibly catchy chorus. I think this is another band I need to hear more from. The Hum Hums's song "Turn Up" is exactly what I would expect from one of my current favorite bands. Lots of wonderful harmonies and a melody that will be stuck in my head for weeks. Short Straw Fate (another of my current favorite Japanese bands) takes things up a notch with their rendition of"Ordinary Persons." They have a bit more of an aggressive sound, channelling their mid 90s influences. They would sound right at home on Crackle or Snuffy Smile. I don't know Cody and The Checkmates, but their song stands out as being mellower than some of the others. A little less distortion than some bands, but they still have a great guitar tone and this is another extremely catchy song. Passive Chord turns the fuzzy guitars back up and their song "Still" reminds me a little bit of the band Thirsty Chords. They are another band I'd like to hear more from. Wrapping things up is Slugger Machine, a band that I do have other records by. "Belief" is their contribution and it's great. The way the guitars sound remind me of a much faster Silver Scooter, but with stronger vocals and more emphasis on the hooks. This is a great CD. It makes me want to hear more of the band that wrote all of these songs, Mainspring, plus it's given me my first taste of three new bands that I'd like to find more records of. It seems like every time I buy a record from Kazu, it makes me want to buy ten more. Is this the mid 90s band Mainspring? If I recall correctly, they were a kind of screamy emo-core kind of band. I had the discography CD and remember liking it a lot.